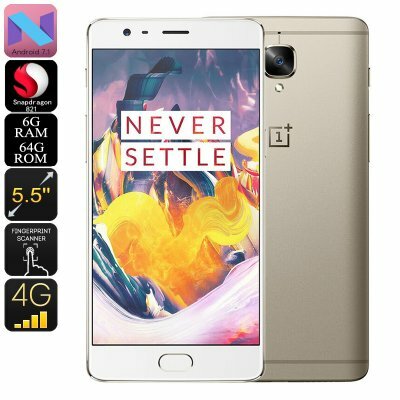 Successfully Added OnePlus 3T Android Smartphone - Quad-Core CPU, 6GB RAM, Android 7.1, 16MP Camera, 5.5 Inch Gorilla Glass, 4G (Gold) to your Shopping Cart. 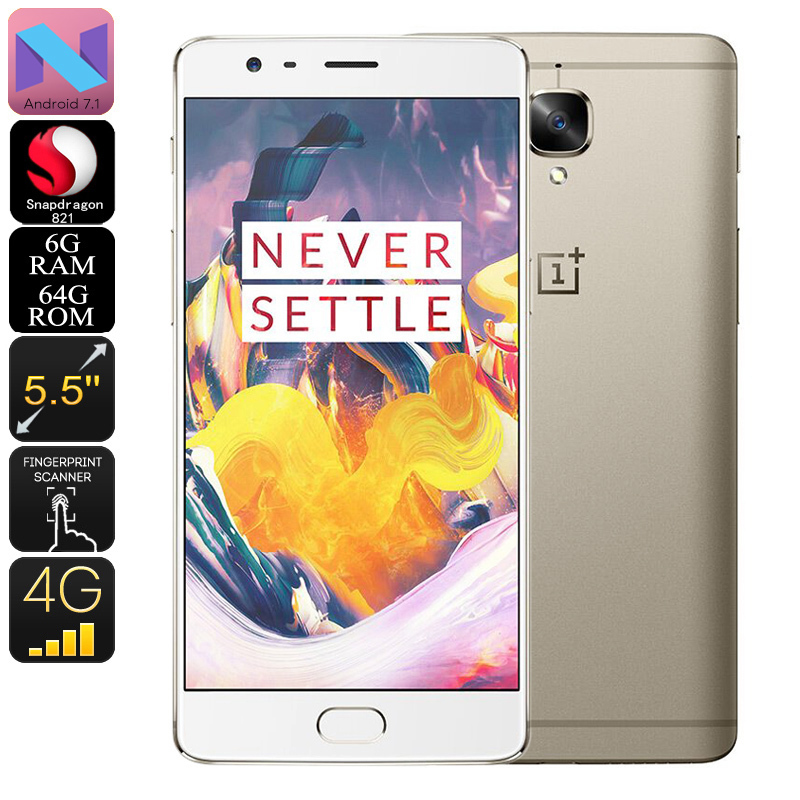 The OnePlus 3T Android smartphone is one of the most powerful and best Android phones from china that is guaranteed to blow your mind with its absolutely stunning user experience. Featuring a sleek and stylish body, this powerful mobile phone truly is a feast to the eye. On its 5.5 Inch Full-HD display it allows you to enjoy your favorite media like no other. Crafted out of Corning Gorilla Glass 4, there will no longer be the need to worry about damaging your screen as this little beauty is virtually indestructible. Along with its android 7.1 Operating System, this Android smartphone is guaranteed to provide a powerful and smooth user experience that suits the liking of even the most demanding of smartphone users out there. Whether you’re into mobile gaming, Full-HD movies, Android Applications, or simply like to use it to make calls and browse the web – this Chinese mobile phone is guaranteed to meet all your demands. Within its sleek body, the OnePlus 3T Android phone packs a powerful Snapdragon 812 processor. This Quad-Core CPU is capable of reaching magnificent clock speeds up to 2.35GHz, letting you enjoy the latest and most demanding games and mobile entertainment available on the market. Additionally, it also comes with 6GB RAM – bringing along great efficiency and multitasking capabilities for those of you that like to enjoy numerous of the phone’s latest features at the same time. The 4G connectivity, Dual-Band WiFi, and two IMEI numbers that this phone supports brings your connectivity to entirely new heights. No matter where you’re at, you’ll always be able to stay connected to your friends, family, and loved ones. Its lightning fast data speeds additionally allow you to browse the web and download files in the blink of an eye – making a laggy internet connection an issue of the past. With access to the Play Store, this Android phone literally provides you with access to an unlimited pool of mobile entertainment – ensuring that you’ll never have to feel bored again. This beautiful smartphone has been equipped with an ultra fast fingerprint scanner that lets you unlock your phone and access your files in the blink of an eye. At the rear of the phone, you'll furthermore be able to find an absolutely stunning 16MP camera that lets you shoot video in stunning 4K resolution and snap breathtaking images of all those special moments in life. A second 16MP camera located at the front of the mobile phone additionally allows you to engage in high-end video calls at any given moment. The OnePlus 3T smartphone comes with a 12 months warranty, brought to you by the leader in electronic devices as well as wholesale electronic gadgets..